Next, I need to thank Matt Hart. I had wanted to do this route for about 8 years and for a first attempt I felt it important to have a solid partner. Finding the right person for a route like this is tricky as there are so many unique challenges from the obvious physical effort, route planning, in-situ decision making, almost guaranteed poor weather, scrambling, bush-whacking, boulder hopping, etc. Matt would be perfect. 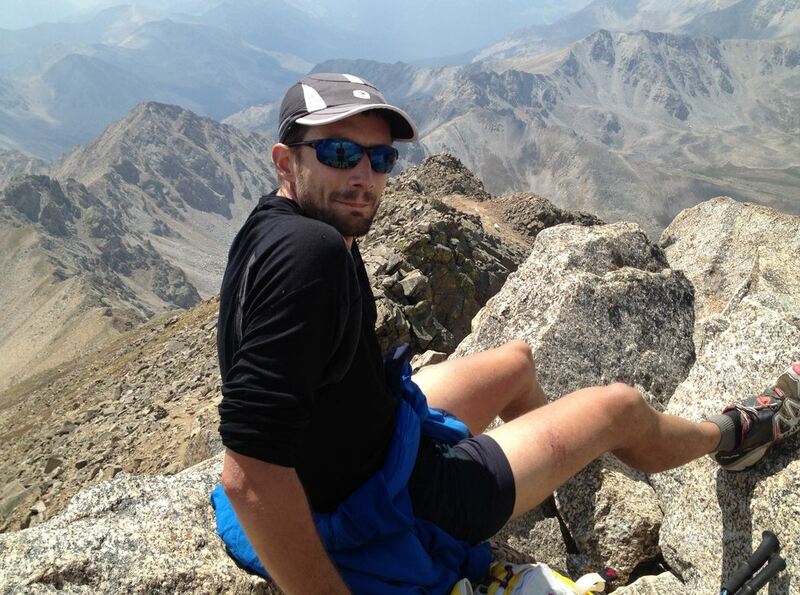 He’s a proven trail runner and his experience with super-long multi-discipline adventure races made him very appealing as a partner. But most importantly, on a basic level, in the handful of years I’ve known Matt and the adventures we’ve had together I’ve learned that his positive personality is minimally affected by adversity. In short, I knew that when times got rough he’d still be able to laugh and have a good time. Okay, now for my wife, Mindy. The smartest thing I’ve ever done is to ask this woman to marry me and the luckiest thing that has happened to me is her saying yes. Crewing for Nolans is an enormous job and as always she did it perfectly. She’d yell, “Welcome to the _______ aid-station” as we’d come trotting into our pre-determined meeting spot. Despite the fact that we were hours later than planned she’d have a smile on her face, get both Matt and I charged up, and boot us out! Fred Marmsater. This dude is incredible and ran around during the entire weekend taking photos and helping crew. Hopefully I’ll get some photos from him to share on this blog post…. 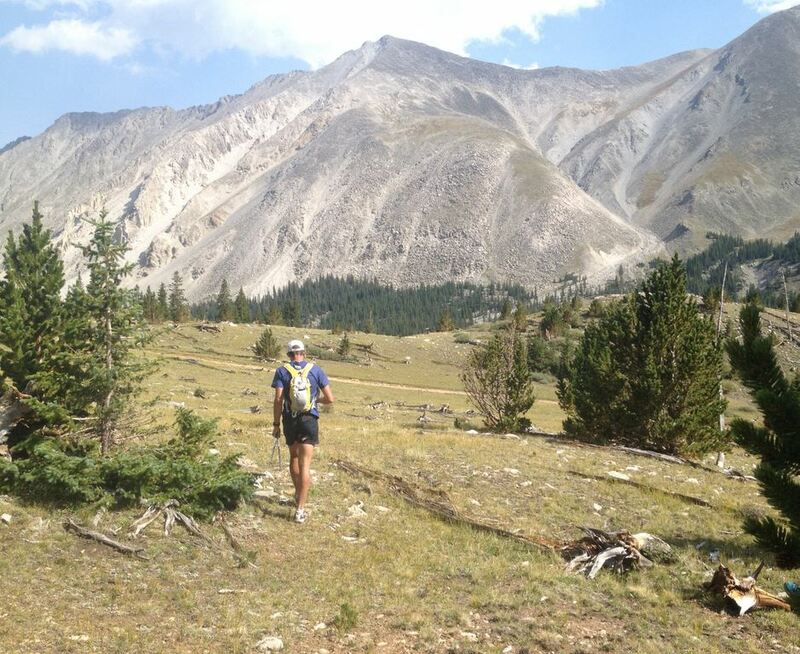 We chose to run north to south, which meant we started at the Fish Hatchery just west of Leadville and ended at the Blank Gulch trailhead on the eastern side of Mount Shavano. We started shortly after 9AM on Friday, August 17th. Nolans is unique in that many of the routes you take up/down the peaks are not common routes. This is largely because you’d prefer to keep the route as short as possible, but try to do so while NOT selecting completely ridiculous routes that would provided an unnecessary thrashing. It’s a tough balance and we certainly did not do it perfectly. But, this is why I like the challenge so much, it’s up to you to figure out what route makes the most sense. Part of the puzzle… If you prefer technical terrain, take the class 5 ridge connecting Harvard to Columbia. If you think you’re faster/safer boulder hopping, drop off the east side and coutour around. 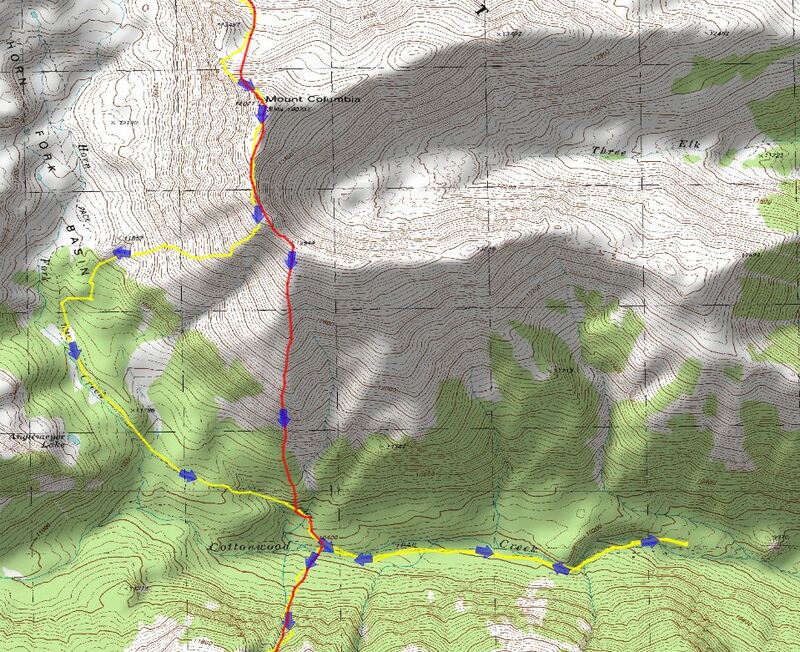 And, if you prefer something that resembles a trail, well, I suppose you might be able to figure something else out…. 🙂 Our planned route was based on 1) data found on-line, 2) several reconnaissance trips I’d made back in 2006, and 3) several days Matt spent in the area a couple weeks prior. Given the relatively minimal time spent planning, I feel it went very well. We mostly stuck to our plan with only a few deviations including our descent off Columbia, an unanticipated but necessary out-and-back to the Cottonwood Creek TH, the descent off Yale, and route into Alpine. My initial mapping effort said it was a 90 mile route, but we ended up logging 104 miles. Now having done it, I see a long list of route and strategy improvements that can be made. The first peak is a big one, but pleasant. The route up the NE ridge of the peak is rarely done, but simple. About 5kft of gain spread over 6 miles so it’s not bad. We had a nice and easy push to the top of this pleasantly direct route once above treeline. From the top we followed the ridge south and then bombed down the Halfmoon creek trail, which was great fun. Lots of small switchbacks, which was different than I had planned, but we weren’t complaining. We met Mindy and Fred at our “aid station”, some 9.5 miles in. Elbert’s a big dog, in fact, it’s the tallest peak in Colorado. 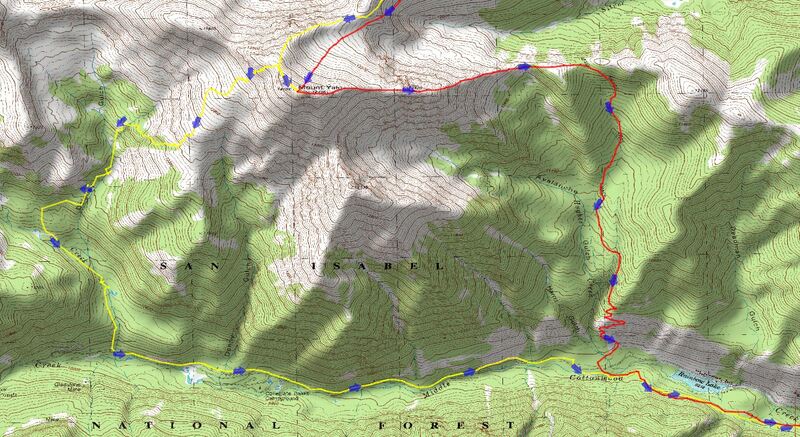 Most folks take the common trail up the NE ridge, but in Nolans it makes more sense to head up South Halfmoon Creek and take an extremely direct line up the west ridge. It climbs from 11,800′ to 14,440′ in 0.9 miles, that’s just under 3,000 vertical feet per mile, gotta love it! It rained a bit and the wind was howling, which got me really psyched. Matt, on the other hand, was in a bit of a funk, but I knew he just needed some time to in the groove. He’d snap out of it. The descent route is fun and was something I had done back in 2006. Traversing Bull Hill was a blast and cruising past Golden Fleece and Last Chance Mines was just plain awesome. The Echo Canyon trail is incredible and had both of us smiling all the way to the road…. 2.8 miles on the road, turn the brain off. Descending Elbert, Bull Hill on the left. One of my favorite peaks, we took the common route up the northwest ridge, which gets continuously better the higher you get. Wow, the view of the Ellingwood Ridge is worth stopping and absorbing, simply beautiful. I was in heaven and with the high winds kicking in it was really getting fun! We had separated a bit on the climb, which was silly, but re-grouped on the summit. My buddy was still in a funk, but I had no doubt he’d pull through. The route down to the Winfield cemetery (our next aid), was incredible. It started raining just as we turned on our headlamps and I felt so alive and psyched to be out. We pulled into the aid to the friendly cheers of Mindy, Fred, and Buzz. We ate some great food and spent time re-charging Matt who was not himself. The great thing about Matt is that he responds really well to positive energy and friends. Before too long we were back on our feet, bound for Huron. It was night-time and also my first time climbing Huron. Consequently, the entire route up seems like a blur. The descent, however, stands out as it was really fun. A steep and very loose gully up high lead to an endless boulder field down to Lois Lake. From here, a Barkley-style bushwack lead to Clohesy Lake. At Clohesy Lake, we cruised down to the Lake Fork trailhead, our next aid and planned 2-hr sleep break. 2 hrs later, we awoke, ready to continue on. Also a new one for me and also in the dark, it was a blur until dusk hit when we were around 12,000′. 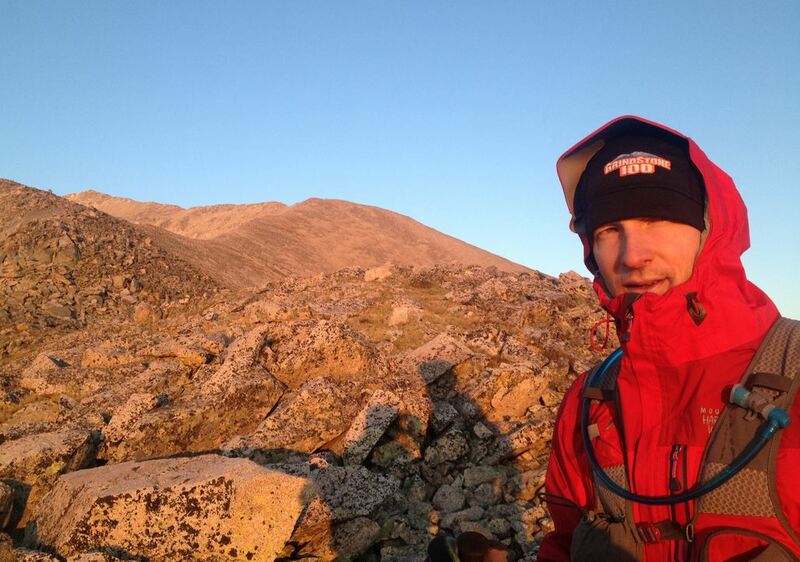 The west ridge was beautiful and gave great views of our next objective, Mount Belford. On any other day I’d take a technical route over a non-technical longer route, however, these circumstances were different so we opted to drop down to the saddle between Missouri and Iowa Peak and countoured around to the trail that climbs back up to Elkhead Pass. Easy tundra and boulder hopping. One long traversing trail lead to the summit of Belford, nothing fancy. Ran into two dudes on the summit who were really psyched to be out. 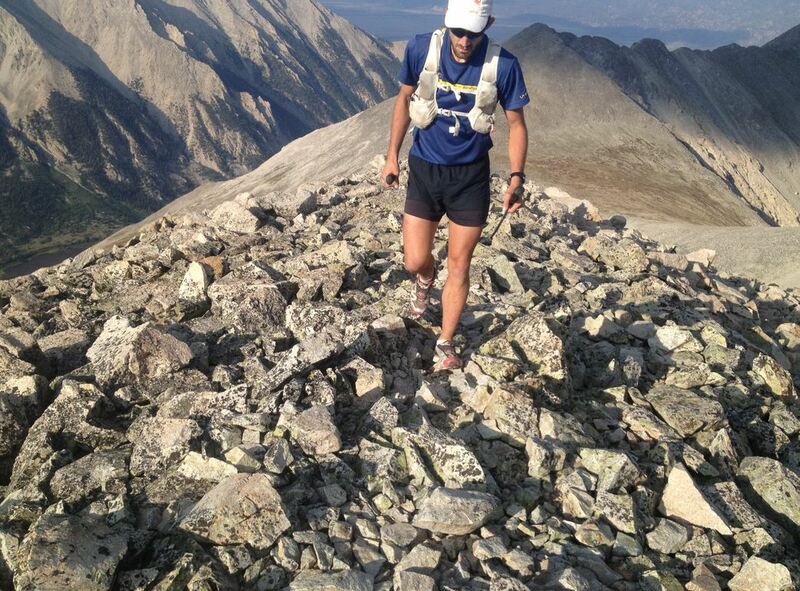 On Belford Peak (I think). Matt flipping the camera off with his glove. No brainer, simple trail connecting Belford to Oxford. From Oxford, you’re presented with a fairly intimidating view of the next objective, the south side of Mount Harvard. The descent off Oxford is steep (~2,500 ft/mile) boulder hopping and tundra. 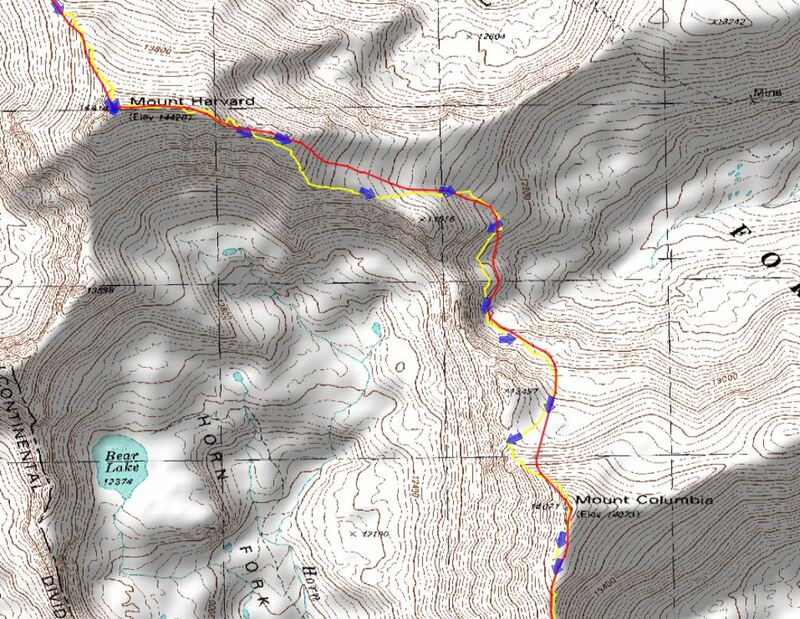 Once down in the gut of Pine Creek, a nice 3300′ climb with essentially no defined route awaits. I hadn’t thought much about this because back in 2006 when I descended it, it seemed like no big deal. However, we ended up thrashing around in the thicket for quite a while before Matt’s deer-like senses turned on and he sniffed out a small trail that lead us up to tree-line. From there it was a steep, but strait-forward ridge up to the summit. Along the way at about 14,000′ we saw an enormous family of beautiful white mountain goats. They took off across class 4/5 terrain with incredible ease, making us humans look silly. Back in 2006 I took the ridge between Harvard and Columbia and had a blast. I knew, however, that probably didn’t make sense 23 hours into our journey, so we opted for a traverse on the east side of the ridge, some 400-600′ below. Turns out, it was really fun boulder hopping through a field of car-sized stones. We ran into a very nice man who was out for a day-hike with a huge pack. He was intrigued by our advanture and hiked along with us for a bit before bidding us farewell. 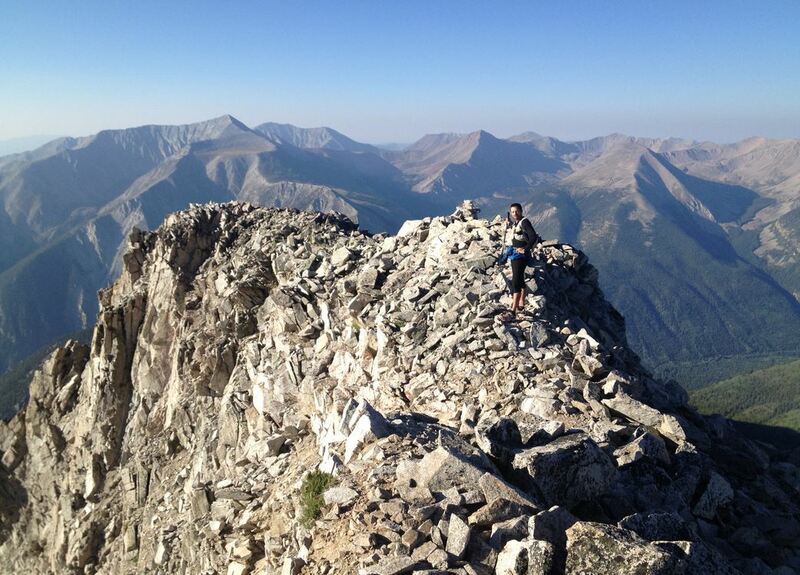 We scrambled up the north ridge to the summit and took a few minutes to take it all in. Sadly, we blew it on the descent knowingly leaving my GPS route and getting sucked into an awesome trail into Horn Fork Basin. This meant we added an extra ~2.4 miles… We arrived at our prescribed meeting point with Mindy over 3 hrs later than we had told her and turns out we just missed her! Realizing what this could mean, we ran out to the Cottonwood Creek trailhead as fast as we could. Thankfully Mindy was waiting for us and she quickly helped get us back in-gear. This little out-and-back cost us an extra 3.6 miles, but allowed us to get fully stocked for the next beast, Mount Yale. Route from Harvard to Columbia. Red = intended route; Yellow = actual route. 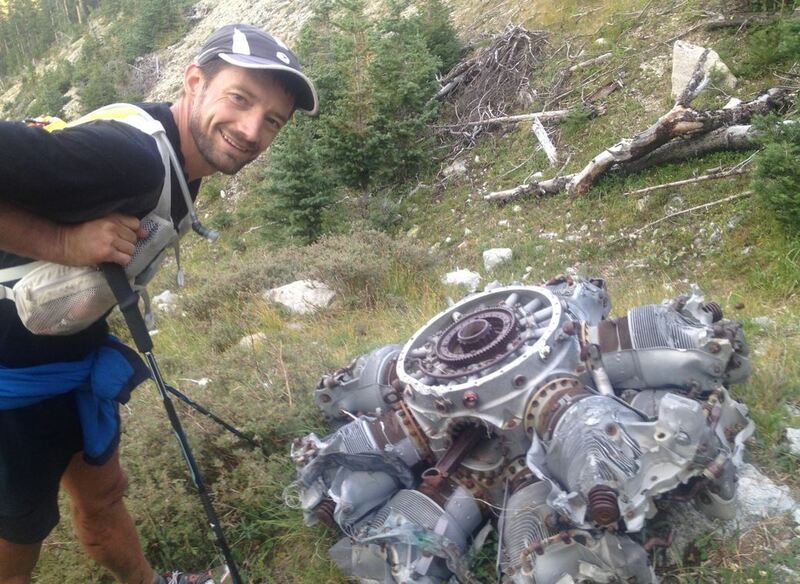 Me with the engine from a plane crash on Yale. We arrived at the start of the climb at about 6:45 PM, our goal being to make it to the ridge with some light still so we could evaluate a potential route down the eastern ridge of Yale. I knew this climb up would be nasty based on what I had read and it was here that my positive mental energy began to waiver. Surprisingly, we read the route almost perfectly, with only a short bushwhack before entering the bottom of the incredibly steep avalanche gully. We veered right, then back left onto something that resembled a trail. In low-four gear, we chugged forward eventually running into the airplane wreckage I had read about. We made the northern ridge in time to see the eastern ridge of Yale and made the decision that we’d descend down the Delaney Gulch trail instead. I was happy that we were making wise decisions at this stage in the game. A poor decision now could cost us the finish. We also decided to ascend Yale via it’s northern ridge rather than the face as originally planned. It was probably “sixes”, but it meant less thinking and navigation. The descent down Delaney frustrated me quite a bit because it was so gradual and kept going west when we wanted to be going east. 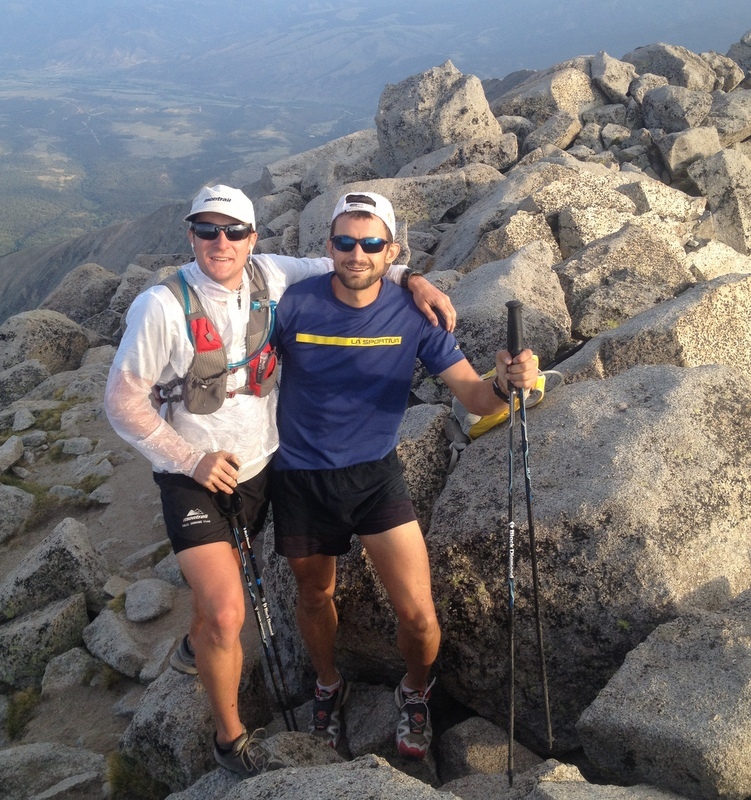 Matt remained positive and was moving very well, while my mental strength was slipping as indicated by my negativity. We hit eventually hit the paved road and ran the 3.2 miles to the car where Mindy was waiting for us. This was our second planned sleep, 1.5 hrs. I woke feeling great! I laced up my shoes and couldn’t believe how un-phased I felt physically. I ate and drank plenty of real food and was ready to get going. We jumped on to the Colorado Trail, which we followed for 7 miles. I felt fabulous and was so happy to be cruising along, confidence high that we’d finish. However, I stopped dead in my tracks and instantly lost all the content in my stomach, what!? Matt was shocked as well and asked, “what caused that?” Sadly, I didn’t know. I dusted myself off and we pressed on. Eventually we reached a point at about 10,000′ where we left the CT, taking a direct route up the eastern spine of Princeton. It was the middle of the night so our navigation was completely GPS-based. We both climbed slowly, and I had several stomach-content-tossing episodes, which wasn’t fun, but sadly not unfamiliar. Nothing to do other than press on. Somewhere between 12,000-13,000′ we just stopped, looking east, and both realized just how beautiful everything was. It didn’t matter that it wasn’t going the way we wanted it to at that particular moment, we were in a beautiful place and needed to stop and appreciate it. We pressed on to the summit along the pristine white granite ridge. In the process I got my stomach back near the summit, which made me very happy. That, coupled with the technical descent of the western ridge and I was back, psyched as ever and moving well again. Matt wondered what the hell had happened…. We made the descent into the cabin-community of Alpine and our support vehicle at the western end of town. We left our aid station fueled and ready to finish this beast. But it was hot, dry, and full-on sun. This would make the climb up Antero miserable given that it is a favorite among fossil-fuel-athletes, after-all it allows them to liberate carbon all the way up to 13,800′ . My physical and mental state became inversely proportional to the altitude on the climb up, feeling worse and moving slower with every step. 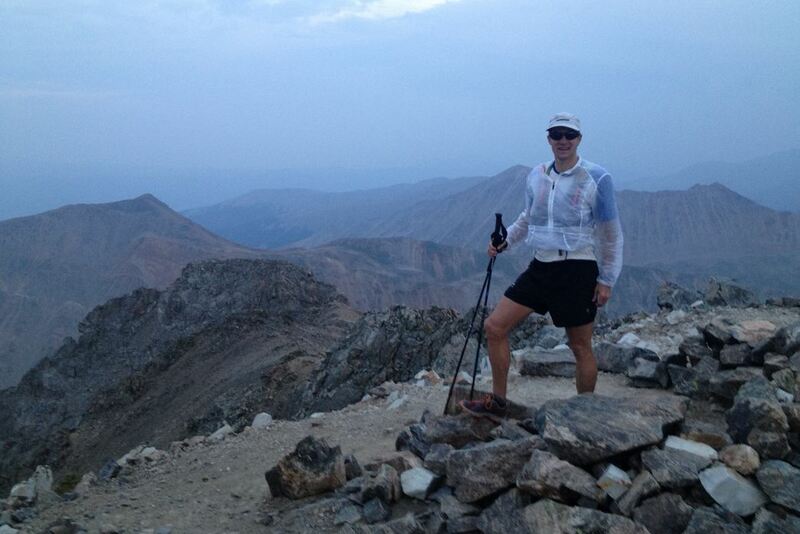 I felt cooked on the final summit push and my stomach had gone very south, caloric intake dropping to near zero. damn. Eventually we summited and began descending, leaving the jeep road and dropping into Browns Creek. Matt was out of water and I was over-heating. We found a cool spring which brought some life back into us. 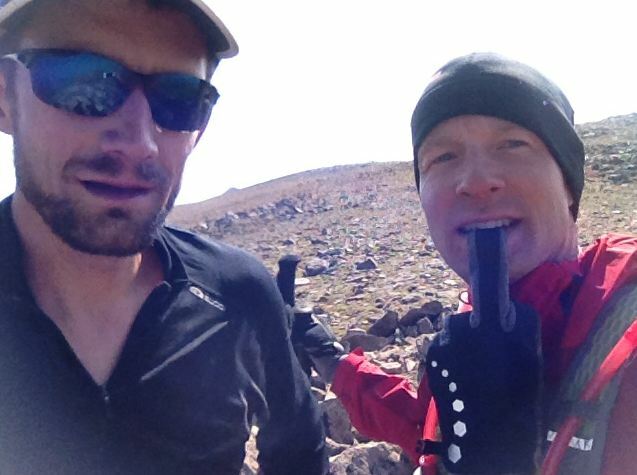 We milked it for a while, getting psyched for the last major climb up Tabeguache Peak. Standing at the bottom looking up, all I could think was wow, this is a much bigger climb than I had in my mind. 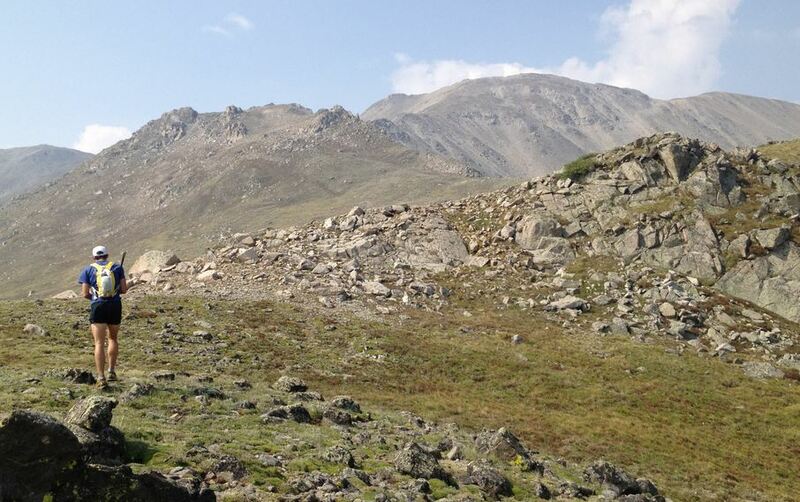 We read the steep route perfectly, following cairns and winding our way up the boulders, scree, and high tundra. However, it was very stressful for me as I knew that we didn’t have much room for error and my condition had degraded to “absolutely terrible”. I was operating on reserves; basic system functions like thermal regulation, heart-rate, and breathing were all out of whack. Matt was moving well, and I was bummed I couldn’t be a better partner at that point. Sadly, our highs and lows were out of phase. I did all I could to keep pushing. My heart-rate and breathing were incredibly fast and intense for such a pitiful amount of mechanical output. My mind instantly flashed to May 9th, 2000. I was in my father’s house, surrounded by his siblings, his wife, his mother, and his children. After a long and valiant fight with ocular melanoma, the cancer he had been battling had metastasized to the plural membrane of his lungs resulting in a very quick and lethal degradation of his health. I sat by his side, my hand on his chest, feeling every laborious breath and heart-beat through his last. In incredibly depleted and emotionally taxed states, the memories burned deepest in our souls tend to rise to the surface, clear, vivid, and powerful. As my own heart raced to pull me up Tabeguache, all I could think about was this moment with my father. But the role reversed, and I envisioned him placing his hand upon my chest to help calm my heart and breathing. It gave me strength and focus and eventually I reached the upper saddle. One push up Tabeguache and another over to the summit of Shavano, we did it. We ran down to the car in what felt like a blistering pace. I was thrashed and it felt so good to finish. Final time at the parking lot : 58 hrs 58 min. Me, with the final climb in the background. What an incredible journey. I loved everything about it from the extreme highs to the extreme lows, each providing contrast for the other. 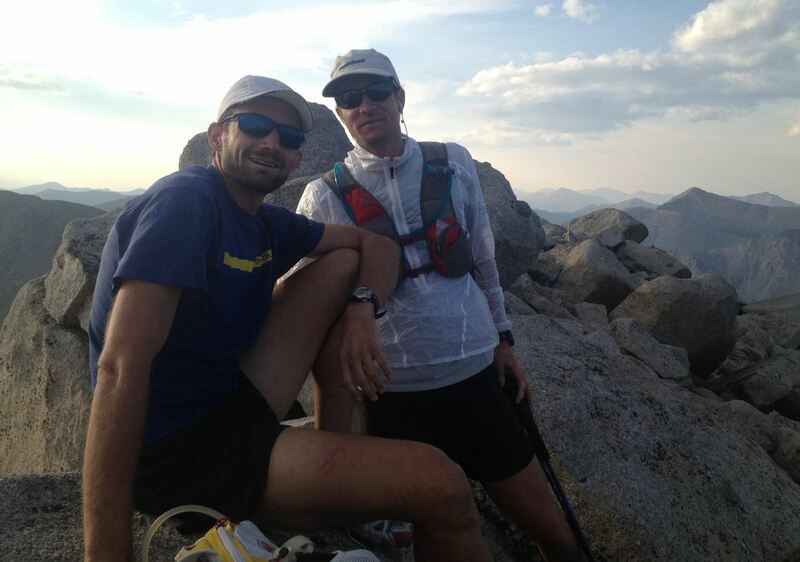 Tackling this with Matt was a real treat and gave me a heightened respect for him as a person and as an athlete. Will I be back? Absolutely. It truly is one of the finest mountain challenges I’ve experienced to date and there is so much more I need to see, experience and learn in the Sawatch. If you’d like any data or tips, don’t hesitate to contact me, I’m happy to share any and all info I have. Picture album here. Jared, I’m looking to make an attempt on Nolan’s 14 next year and I was wondering if you would be willing to share your GPX file as a starting point for a route. Thank you! I finally read all your post !!! increible dudes. Matt is a beast ! Jared’s mom here. Truly inspiring to have a son doing these amazing things. You were always an incredibly positive kid and you really are super human. Thanks Matt for going with him!!!!!! Awesome job you two! Congratulations! Rest up! Awesome report! Sounds like a great adventure!!!!! what kind of gps did you use that lasts 59 hours? or did you swap batteries/devices with mindy at points? might be a major reason why you succeeded….? thanks for the inspiration, THIS is what makes us feel ALIVE. A big congratulations! What a great experience. I’m truly impressed at your tenacity to grind it out with smiles (and some vomit). Keep it up! See you at Wasatch. Jared – so stoked for you and Matt! Huge congrats and respect. Right on. Wow. That is incredible. Congratulations to both of you on a truly awesome accomplishment. Looks to me like the summer of slog has been a great success. Hey Christian. Yep, I’m working towards the USOY award, a special award given out by coachingendurance.com. Wasatoja and Millwood might seal the deal. See ya round! Just when I thought Hardrock & Barkley would be at the top of my bucket list you go and add something like Nolan’s 14 to my dreams. Amazing adventure! I enjoyed following the SPOT all weekend. I was impressed with how consistent you guys were. I thought for sure you two were bailing out when you went out to the Cottonwood Creek Trail and was elated to see you come back for more. Congrats to both you and Matt! Can only join the chorus: well done! Remarkable achievement. Your well written report brought me joy as I joined you for a taste of the journey. Thank you! What an amazing trip! It’s going on my bucket list. Looks grand. 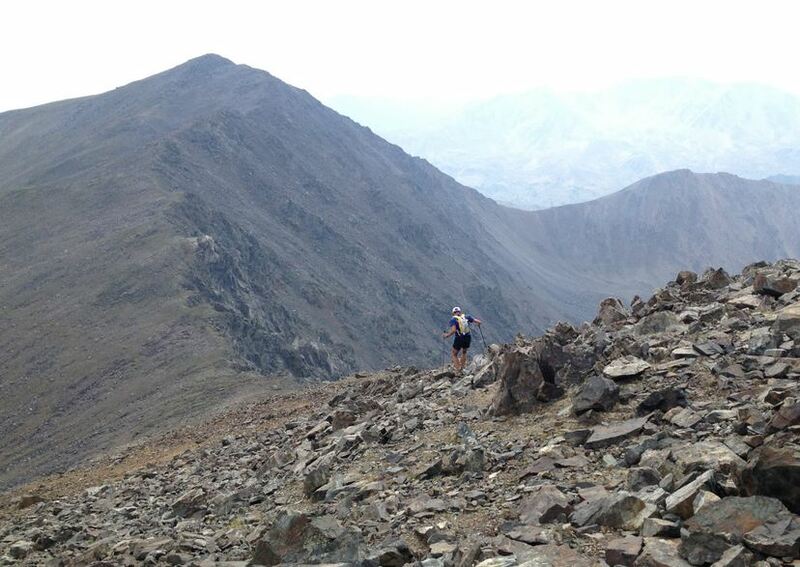 “It’s not a real ultramarathon unless there is at least one hill that gives you nightmares.” Your posts are very inspiring for us mountain runners. Super bummed about missing out on Pocatello this year, but I’ll be back next May with my wife and new little boy, so you can say hello (and I’ll be the first to sign up if there is a 100). BTW-what do you use for a gps device, that can last for 60 hours? Anyway, enjoy the rest of the summer, maybe come up to IMTUF 100 if you want. It’ll be a good one. Congratulations guys that is awesome. It was an honor to be able to hike with you for that short while. You have inspired me to kick the cardio up a notch (and lighten my pack). Maybe our paths will cross again someday and i’ll be able to hang a little longer. Great job and a pleasure meeting you both. Inspiring stuff. Great job to you and yur crew. would love to give that a go someday. WOW! Great job! Super inspiring! Awesome Jared! Truly awesome! Congrats to you and Matt! We drove by that Saturday of Leadville heading to check out the race and Krissy and I looked up towards Harvard channeling good vibes and energy your way!! What an amazing adventure you guys shared! Truly impressive. Amazing! it was fun following along congratulations to you and Matt. Great report, Jared, and an even better adventure. I wish I could have gone with you guys, but I’d never have been able to keep up. Congratulations Jared & Matt ! It’s so hard to imagine anyone doing this it’s almost surreal. Adding the Barkely and Hardrock within months of each other and it’s almost incomprehensible. Definitly one for the record books. Awesomeness! Kudos to all of you for the efforts. Very impressive and epic in true definition. And having completed the Barkely, Hardrock, Nolan’s 14 “trilogy” in the same year is a HUGE accomplishment to say the least. I’d be interested to know if anyone has done that. Well done! The year we finally finished Nolans 14 happened to be the same year (2001) that Horton and I finished Barkley. Of course, there was Hardrock too. But we didn’t do any of the three as fast as Jared did this year! How awesome is this?! I am in awe of anyone who can achieve this feat. This is right at the top of my bucket list. Great to hear Tim. It should be on every mountain lovers bucket-list. So awesome. The GPS profile really brings the point home. Also thank you for sharing your very personal experience ascending Tabeguache. Amazing. How do Barkley, Hardrock, and Nolan’s 14 compare? Was one significantly more challenging than the others? Were they similar and how were they different? Thanks for your kind comments. Regarding how they compare, but, in order of difficulty, I’d say Nolans, Barkley, ….. Hardrock. Good god, man, that’s awesome! 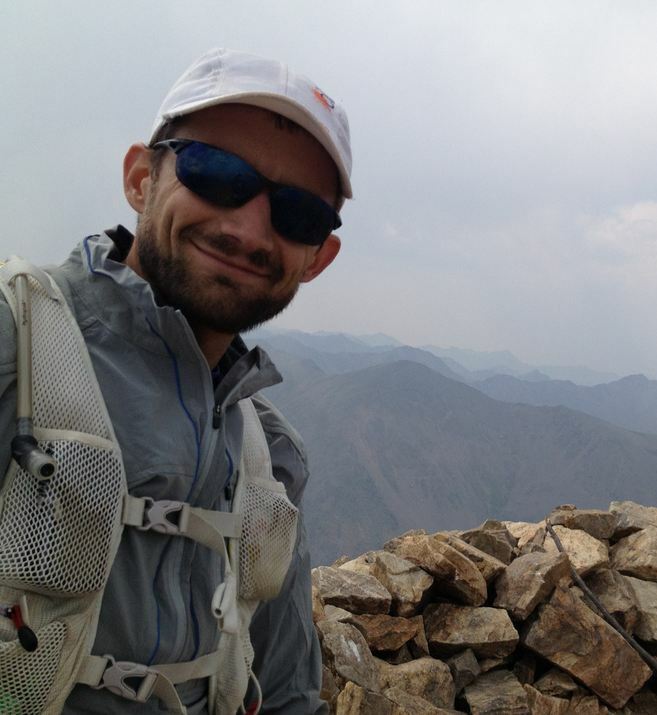 Great job and write-up … and GPS Profile! !